By Sheila - Fiji - 28 Aug/03 - Viewed 1421 times. Today Mark & Laura, Laura's parents and brother, and Paul were due to arrive, all on different flights. Mark and Laura were due in first at 9:35. We arranged to go to meet them on the hotel bus and despite this being delayed by an earlier flight arrival, we arrived just as they were coming thru from customs. It was nice to see them after 4 months away. Next to arrive was Laura's parents and brother just after lunch. At 4:30 we went for our 2nd golf lesson. It was a lovely balmy evening. On the first green I putted from the edge of the green in 1. Beginners luck! One over par for us both on the first hole. The rest of the course was of mixed fortunes but i discovered that i could at least play the game reasonably well. By the time we had finished it was nearly dark. It's dark by 6:30 here. Ilisea seemed to have forgotten he'd promised us a free round tho, as he rushed to our room later and asked us to sign for a chitty for F$11.00 which we assumed was for the golf clubs. Finally at 7.25 we went to the airport again to meet Paul. Reception had offered to call us when the bus was due to leave but when we came down it had already gone. We were sitting around looking dejected when one of the many chaps who hang around in the lobby came over and said he had phoned the driver to come back for us! The flight was in when we got to the airport but luckily we found Paul still waiting for a taxi. We all met up for dinner later and were surprised to find everyone had brought cards and presents for our birthday. After dinner the lights dimmed and we thought they were hinting for us to leave. 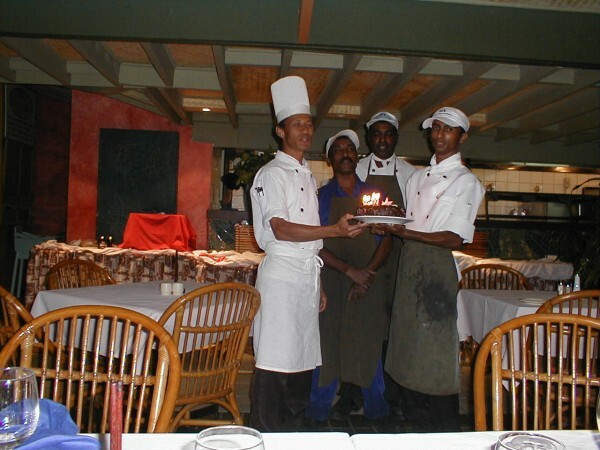 Instead a choir of chefs emmerged from the kitchen carrying a birthday cake lit by 10 candles. They sang 2 verses of Happy Birthday' the second being 'Happy Long Life.....'. Laura had arranged the cake earlier while we were playing golf and they had obliged even though they had only a couple of hours notice! It was a lovely end to a perfect day and better still we were all assembled ready for the wedding in 5 days time.